Last month I wrote about some of the best countries in the world if you're a meat lover. So it's only right to follow-up the previous carnivorous article with a post about some countries where eating non-meat meals is especially enjoyable. Though I'm not vegetarian, as much as I love meat, I love fruits and vegetables equally. As a country with the world's largest amount of vegetarians, India has developed some seriously tasty recipes for pure-veg cuisine. It is estimated that over 30% of the population doesn't eat meat, and with a population the size of India, that's a massive statistic. Beans, lentils, chickpeas, and paneer cottage cheese, are just a few of the wonderful ingredients that can make a vegetarian meal in India so delicious. But it's the abundance of spices that really add excitement and vibrancy to Indian vegetarian cuisine. I've personally never traveled to India, but I have had quite a few Indian vegetarian meals at restaurants in other countries that were superb. If I needed to become a vegetarian, I would be quick to move to India! Thailand is a country that has it all when it comes to cuisine – everything from meat packed dishes to fresh herbaceous vegetable dishes. If you are a strict vegetarian though, be careful as sometimes the so-called Thai vegetarian food uses fish sauce and meat broth (depends on your strictness). That being said, there are many designated vegetarian restaurants catering mainly to those that eat vegetarian for religious and cultural purposes. Thailand is also a country that produces a glorious array of fresh fruits and vegetables. Sliced tropical fruit is available year round and pieces of pineapple, watermelon, mangoes, and papaya can all be purchased pre-sliced from street vendors throughout the country. The annual Thai vegetarian festival is a paradise on earth for vegetarian eaters. 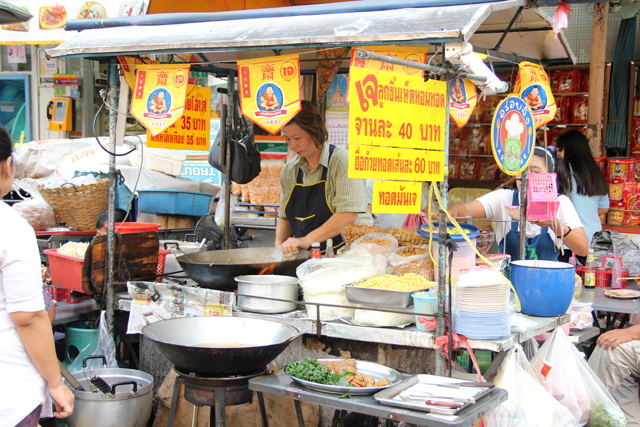 Though the main festival takes place in Phuket, just about every city in Thailand has a crowd that cooks and eats vegetarian during this period. Vegetarian friendly stalls are marked by yellow flags. 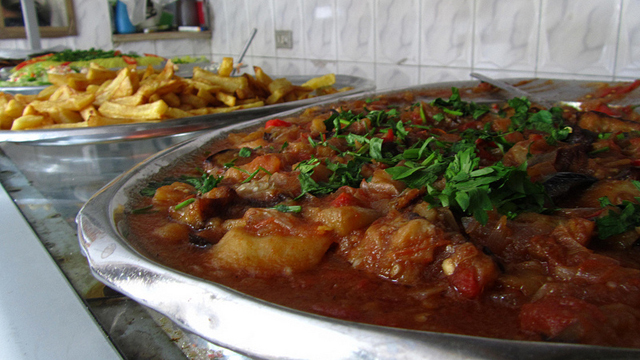 Some of the most famous dishes in Egypt are vegetarian. While I was traveling in Egypt, in order to eat cheap and local, I ended up eating vegetarian by default quite frequently. Ful medames, a fava bean mash that's similar to Mexican refried beans, is one of the staples of an Egyptian diet. Not only does it taste good, it's filling and nutritious. Everyday I would stop by a local Egyptian sandwich stall and grab a bag full of pita wrapped sandwiches filled with ful, falafel, or fried eggplant, and garnished with pickled vegetables. They were delicious! Cuisines form around the Mediterranean have been perfecting a variety of vegetarian dishes for centuries. 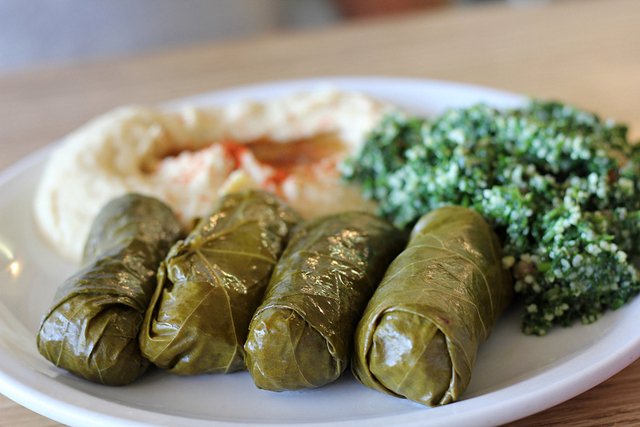 Okra, cauliflower, lentils, all sorts of beans, tomatoes, and many types of pickled vegetables and olives are important in a Lebanese diet. Hummus, which is a staple in many Middle Eastern cuisines, is one of the world's finest dips – a smooth blend of mashed chickpeas, lemon juice, olive oil and varying garnishes. Eggplant, which happens to be one of my all-time favorite vegetables on the planet, is a major component in a number of wonderful Lebanese dishes as well. As a country that includes a growing percentage of health conscious individuals and is composed of cultures from around the world, the United States has an ever-expanding supply of vegetarian restaurants. When I went back for a visit in the US, I noticed plenty of restaurants ranging from pure-vegetarian Indian eateries to trendy looking fusion vegetarian restaurants. Along with places to eat, there's a rising number of supermarkets and farmers' markets that supply a great selection of ingredients to cater to a healthy vegetarian kitchen. So while it's possible by making the effort to eat vegetarian or mostly vegetarian in whatever country you travel to, these countries make vegetarian food into meals to look forward to! Although not the food image it projects, Germany has 6,000,000 plus vegetarians. Vegetarian choices in United States are mostly confined to larger cities and to smaller towns with university populations, as well as to more rural areas in places like along the California coast, western Oregon, Vermont, etc. In other words, you can travel in much of the U.S. without frequently encountering vegetarian protein items in cafes and restaurants, let along vegan ones, though less so if you make good use of sources like Yelp. It will come as a major surprise to most non-vegetarians, especially if you haven’t traveled in Germany in the last few years, but Germany is quickly becoming one of the best countries in Europe for vegetarian food. It’s still fairly city-based, but there are vegetarian restaurants and oodles of international restaurants (with veggie options) in almost all of the major and medium-sized cities. Berlin in particular is incredible, but I’ve also been to some great places in Leipzig, Nuremberg, and Munich. For a country that’s world famous for its traditional meatiness, it’s pretty ironic… but we vegetarians certainly aren’t complaining! Lastly, I have to agree with your choice of India as country #1 for vegetarians. It’s one of the main reasons I’ve visited 6 times and lived there for a year! Egypt was also surprisingly more veggie-friendly than I expected, and I’ve heard great things about Lebanon from travel mates. I can vouch for India on the veggie side! I’m not sure if you’d fancy eating the meat in the street stalls anyway! Also Australia’s pretty good for veggie stuff, especially around the main cities. In Melbourne I had a massive arrange of Veggie restaurants and veggie sushi! You missed the best Egyptian Vegetarian dish…..KUSHARI!!! rice, lentils, chickpeas and macaroni topped with tomato sauce and fried onion. SOOOOOOOOOOO GOOD and so cheap!!! Kushari was my favorite food in Egypt! Thanks for the info on the yellow flags, that’s a very handy tip for travel to Thailand! I’ll flag that as something to remember when I get there one day. And my favorite Lebanese vegetarian staple is labne, strained yogurt cheese. I can’t get enough of it!